This dish tastes delicious and will be ready in no time. Heat 2 tablespoons of the olive oil in a large heavy-based frying pan. Season the cod and add to the pan, skin side down. Cook for 2 to 3 minutes, until the skin is beginning to crisp. Add the butter to the pan and cook for another 2 minutes, until the skin is nice and crisp. Turn the cod over and cook for a further 3 to 4 minutes, until cooked through. Transfer the cod to a warm plate and keep warm. Add the remaining 2 tablespoons of olive oil to the pan, then pop in the chorizo, courgette and red onion. Cook for 3 to 4 minutes, until the chorizo starts to crisp. Finish with the lemon juice. To serve, place the chorizo, courgette and red onion on a plate. 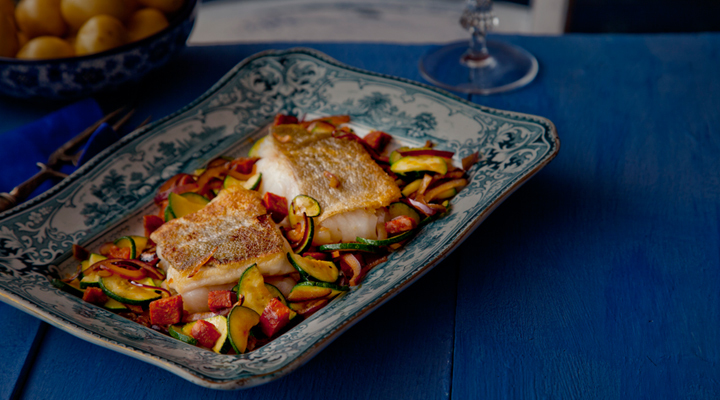 Top with the warm cod and serve with boiled new potatoes. If you want to cook the cod on the barbecue, make sure the barbecue grill itself is good and hot so the fish seals and doesn't stick to it. Season the cod well and rub both sides with olive oil. Place on the hot barbecue and cook for 3 to 4 minutes on each side. Alternatively, you could wrap the fillets in a tin foil parcel with a little butter, seasoning and some fresh herbs, then pop it on the barbecue for 6 to 8 minutes.